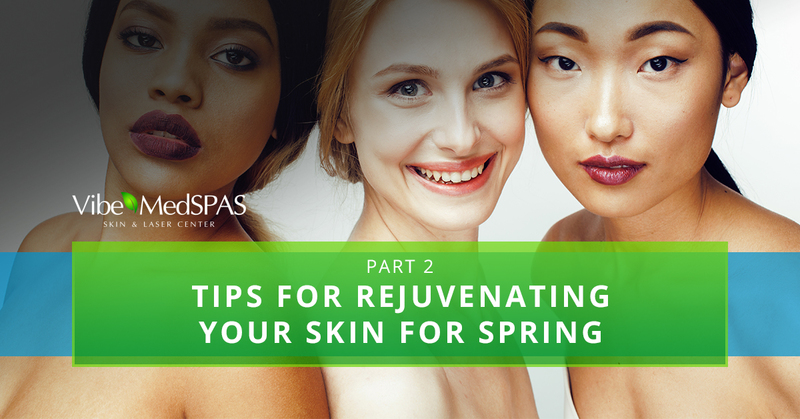 Let’s look at a few more ways you can improve your skin’s texture and appearance this spring in preparation for the warmer months ahead. And remember, you can count on us, your Top Rated Local® med spa in Scottsdale for all of your skin and body rejuvenation needs. On average, the human body contains about 60 percent water, and about two-thirds of that water is found in the cells. Cells are responsible for creating new skin. Therefore, to achieve skin that looks and feels amazing, you must continually replenish those cells. Drinking plenty of water, which, for adults is about eight 8-ounce glasses per day, can moisturize the skin while encouraging cell development for soft, radiant skin. Because the skin is your largest organ, you want to make sure it gets the nutrients it needs to look and feel healthy. Add some antioxidants into your diet by eating blueberries, strawberries, cherries, spinach, kale, and broccoli. You’ll also want to get plenty of Omega-3 fatty acids to improve your hydration levels and enhance cell production. Eating salmon, nuts, eggs, and chia seeds will give you a boost of Omega-3s for glowing skin. We get a lot of sun here in Scottsdale, so it’s important to wear sunscreen to protect the skin on your face and body. The damaging UV rays produced by the sun can create lines and other imperfections that affect the appearance and texture of your skin. Most experts recommend wearing sunscreen with SPF 30 to effectively shield the skin from the sun’s damaging rays. Don’t forget to reapply often! If the skin on your face and body could use a boost, call Vibe MedSpas to book a skin care or body treatment. From Botox and dermal fillers, chemical peels, and Vampire facials, to laser resurfacing and radiofrequency treatments, our med spa in Scottsdale has a spa service for you. Give us a call today to book a med spa treatment to give your skin a rejuvenating boost this spring. Our med spa treatments will not only enhance your natural beauty, but can help you feel radiant, inside and out. This concludes our short blog series but be sure to check back next month for more health and beauty tips. Thanks for reading!